Sounds Like Sunset are back in the spotlight with their new single ‘Open Up My Eyes’ – equal parts shimmering noise pop, infectious hooks and bursts of the swirling, fuzz-pedal-friendly noise that’s defined their sound for over a decade – plus a chorus you won’t shake for days. Recorded by Wayne Connolly in the big room at Alberts Studios (Neutral Bay/Sydney) in about 2010 – and then lots of DIY overdubs & vocals later (much, much later) at home in Wyoming (NSW) by David Challinor. Mixed by Wayne Connolly in 2013 at Alberts (Neutral Bay) in Doug Mulray’s old broadcast studio on a crazy old refurbished (vintage) Neve desk. Here’s a single we’ve just released called Open Up My Eyes – we’re fortunate enough to be getting airplay on community radio such as 2SER & FBi, and also Triple J on & off (see Soundcloud link below). The main reason I’m sending you this link is because the main drunken-swerving melody lead-guitar line in the song was recorded using my Rich Fuzz pedal. It was perfect for slithering & snarling around underneath the frequencies of all the other guitar tracks – just above bass range but below normal guitar range. I’ve had the pedal for years & years (it’s so old it’s from your pre-LEDs era – you previously had to retrofit an LED in it for me), and of course it’s still a great pedal ! We’re launching the single this Friday night (28th June 2013) at The Square in Haymarket (Sydney). Another innovative indie band to use the Rich Fuzz extensively in their recordings is Sydney’s Circle (formerly Opanoni). 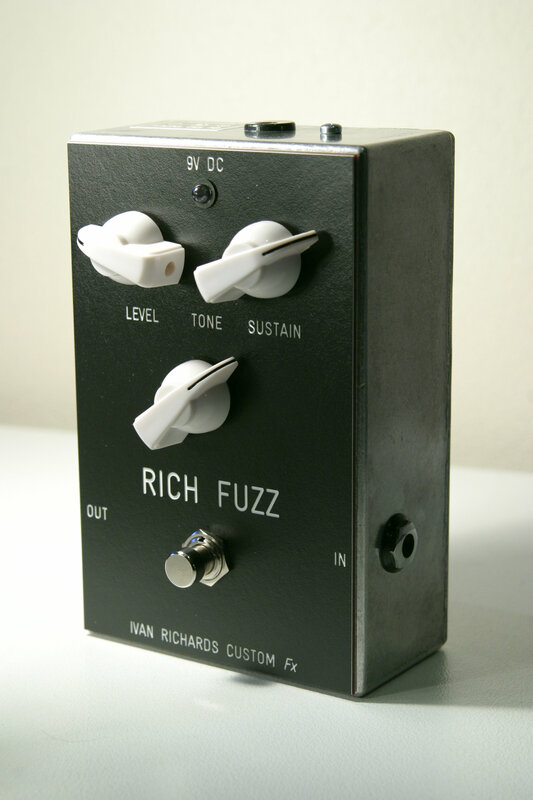 We have been hand-building the Rich Fuzz since 1997, and although the cosmetics have changed from time to time, plus an LED status indicator was added when the 3-pole footswitch became available, the circuitry and component selection has stayed exactly the same, so you can be confident that a Rich Fuzz purchased in 2013 will sound exactly the same as the pedals built in 1997. Currently available from Bondi Intermusic (Sydney) or direct from Ivan Richards Audio. (*) Wayne Connolly is an Aria Award winning producer, engineer, musician & composer with over two decade’s experience in the music industry. This entry was posted on June 26, 2013 at 12:06 pm and is filed under Friends of Ivan Richards Audio. You can follow any responses to this entry through the RSS 2.0 feed. You can leave a response, or trackback from your own site.